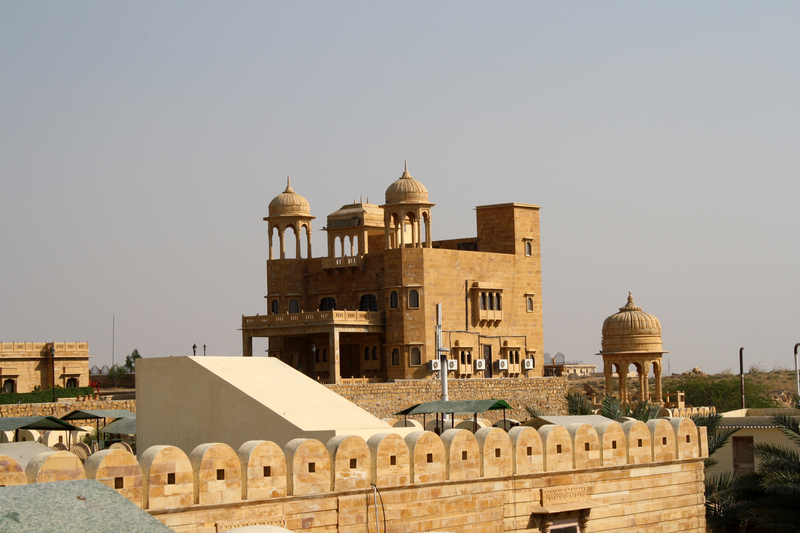 We leave Jodhpur and reach Jaisalmer in early afternoon. 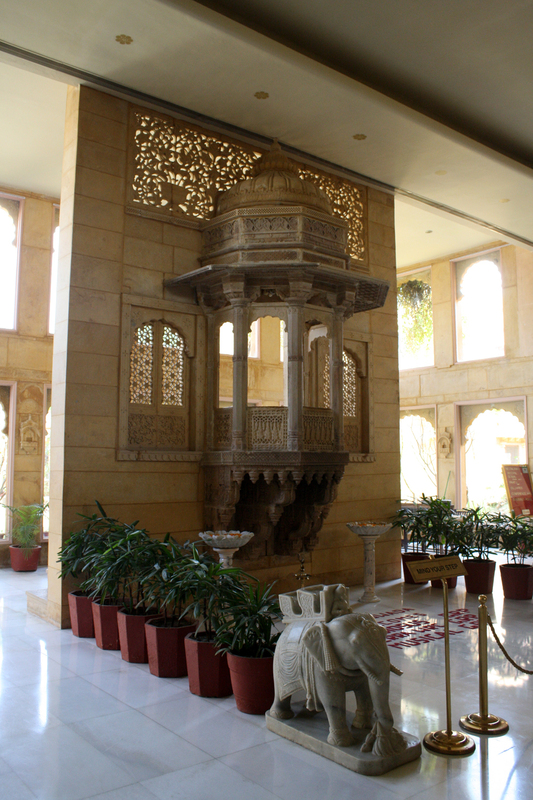 Our hotel is lush in decoration. 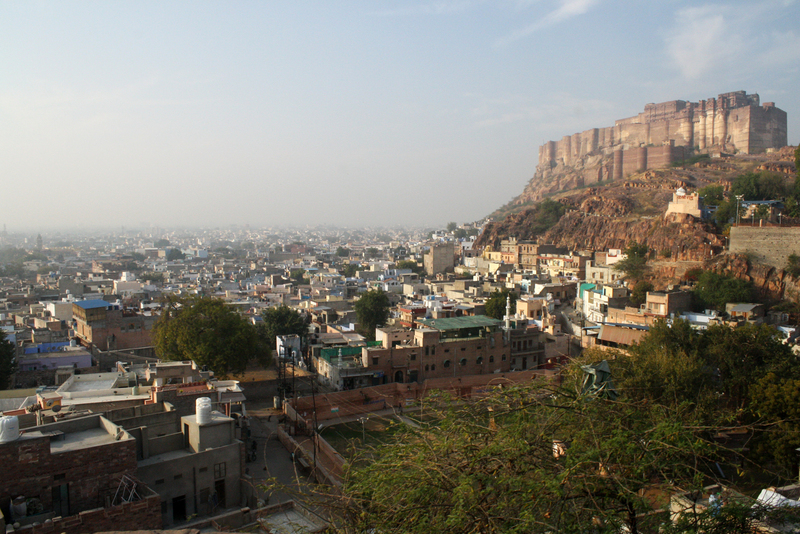 In the afternoon we enter the city and have a rooftop concert with Chugge Khan and a family of the Mangniyar tribe of court musicians. 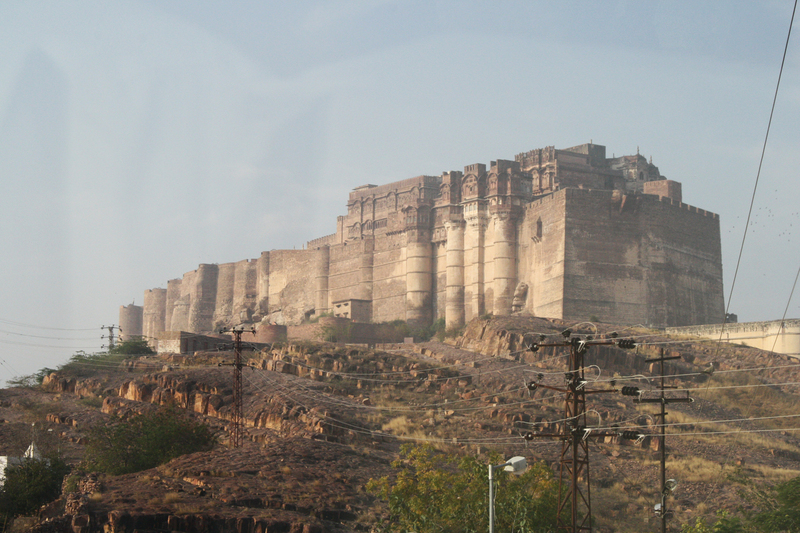 We depart Jodhpur, viewing its imposing fort palace. 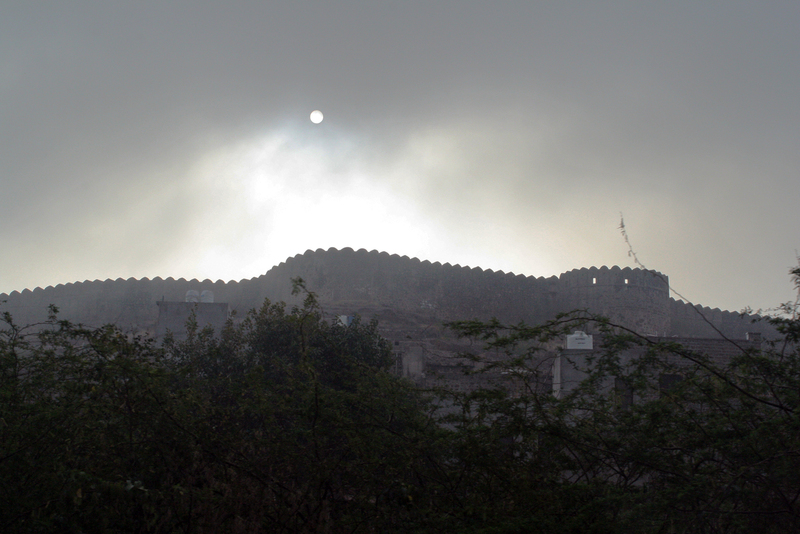 A closer view. Moving down the mountain into new terrain. 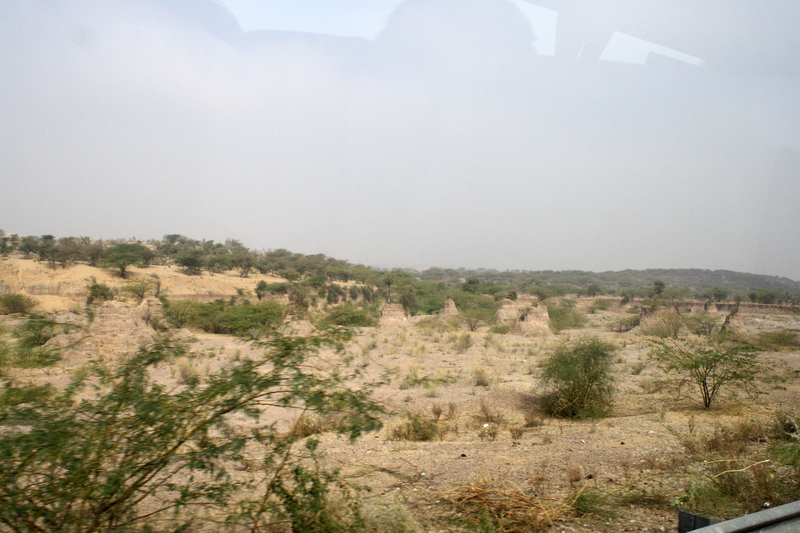 This part of Rajasthan is a desert. Our first view of wind turbines, but only a few. 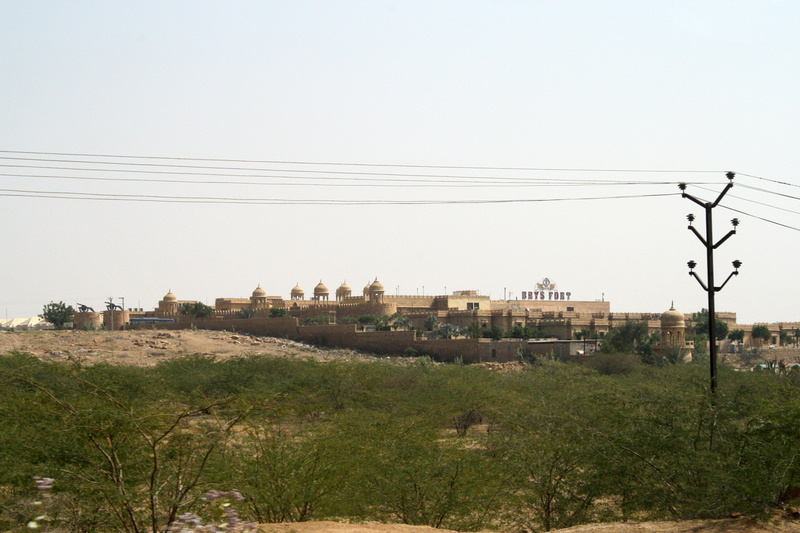 The 'fort' is a 5-star hotel. 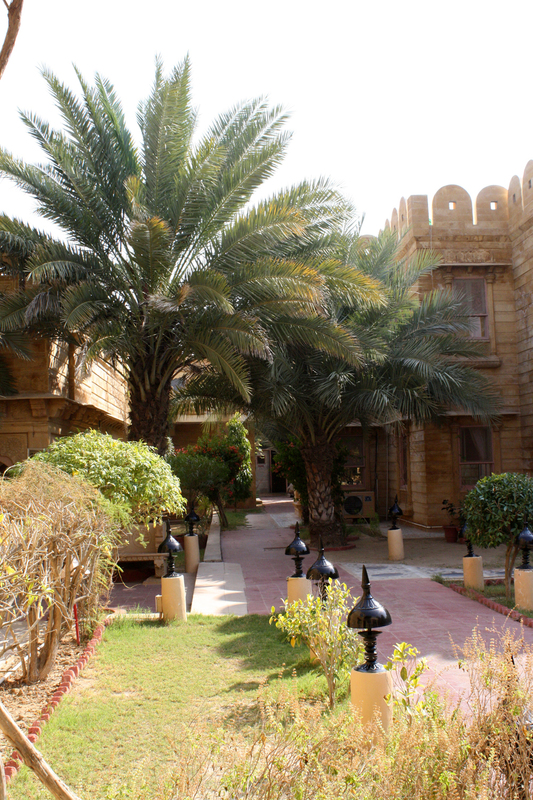 Our own hotel, Hotel Fort Rajwada, is nearby. 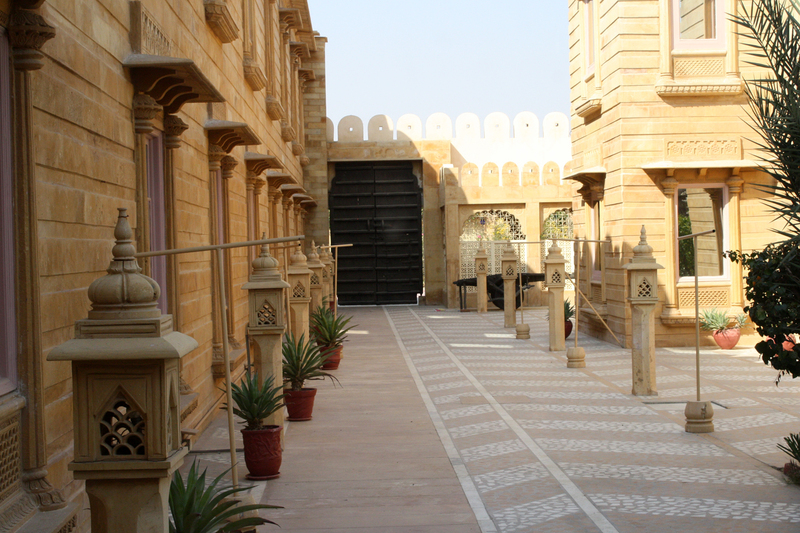 Both are conversions and reconstructions designed and furnished from abandoned desert fortresses, homes, and palaces. The opposite side, whose lantern array is akin to Japanese style. 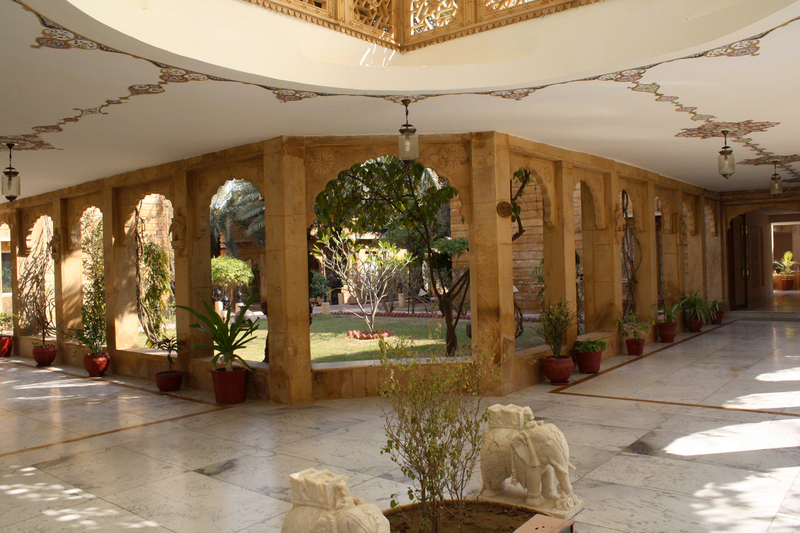 Landscaping in another corner of this large heritage hotel. 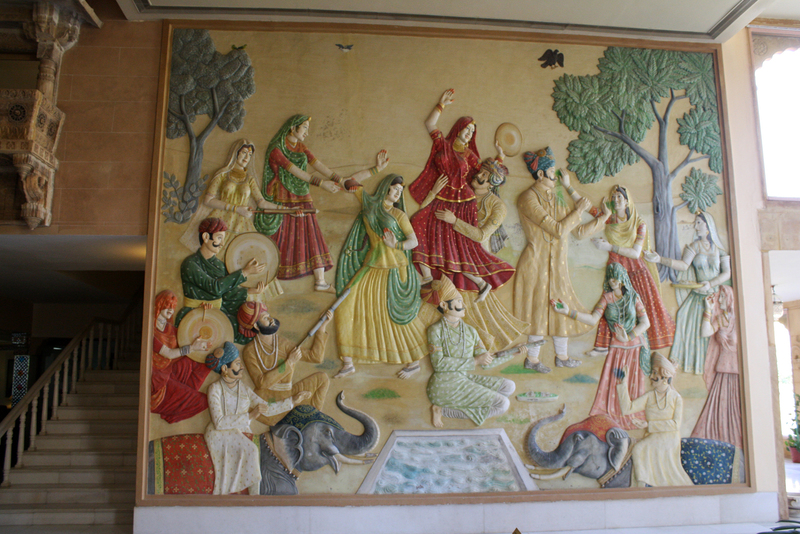 A bas relief depicting the festival of color, Holi, with pigmented powder shot and cast upon revelers. 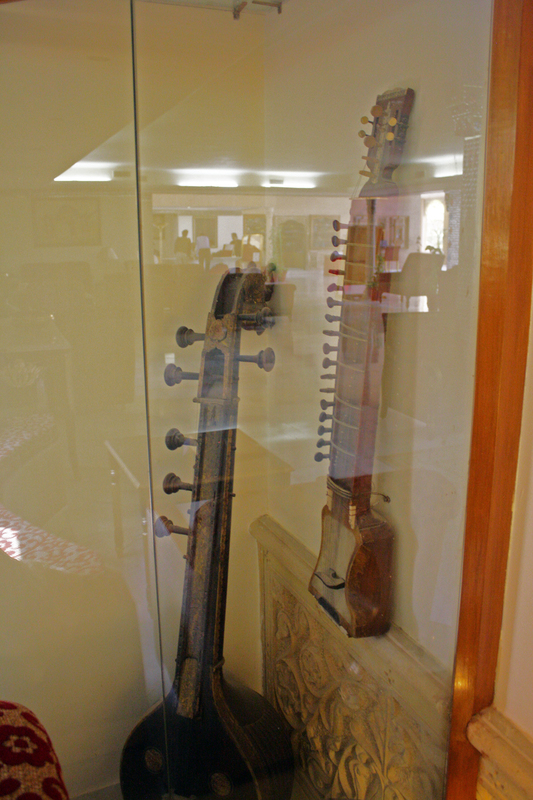 In a display case, two old instruments: a 6-string tambura drone and a Sindhi sarangi fiddle. Interior design; façade. 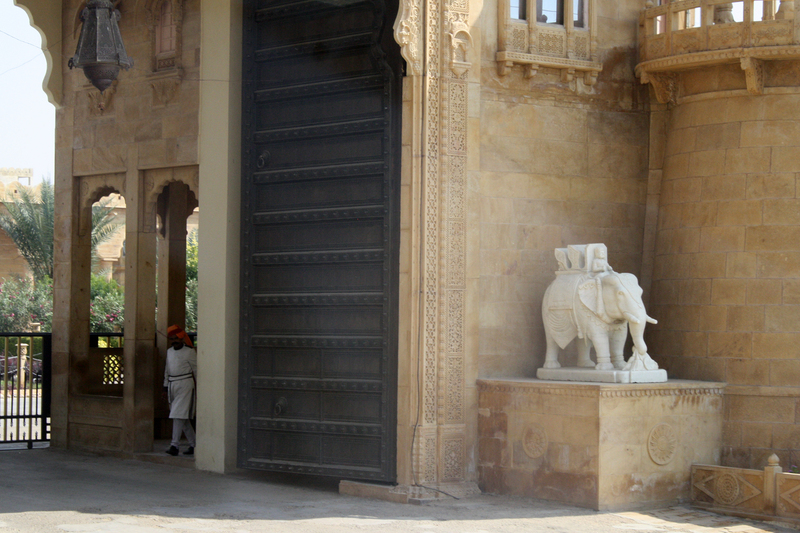 Hearst also took architectural structures and installed them into his 'castle." An array of flower designs. 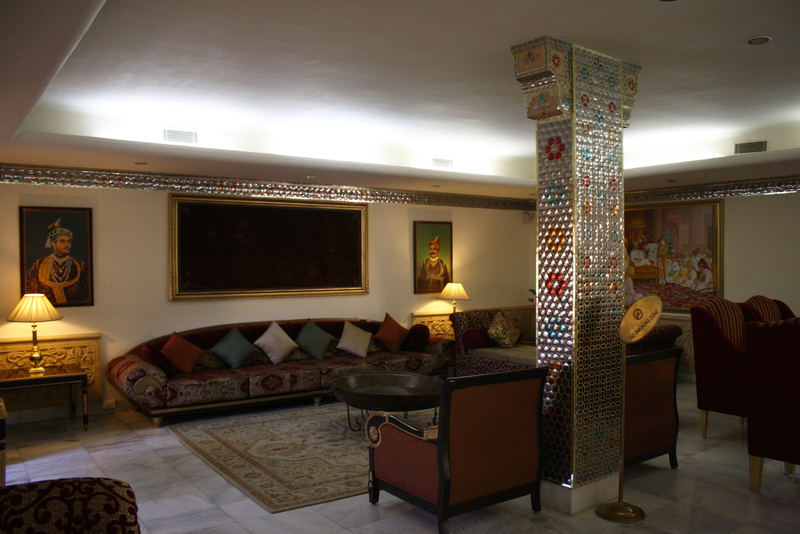 To the right is the dining room, to the left leads to my room. 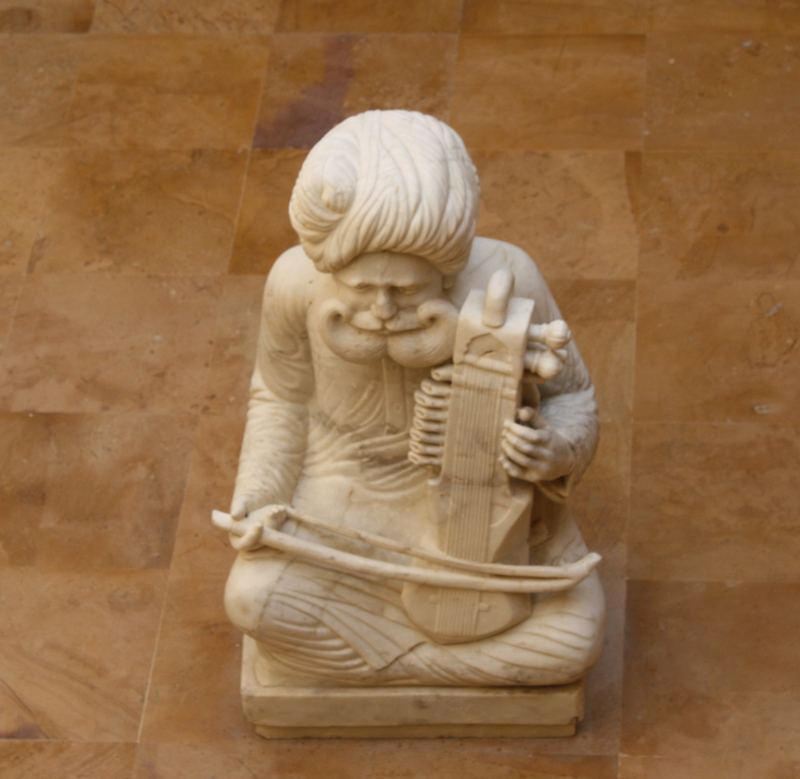 At the bottom of my courtyard is this sarangi player. 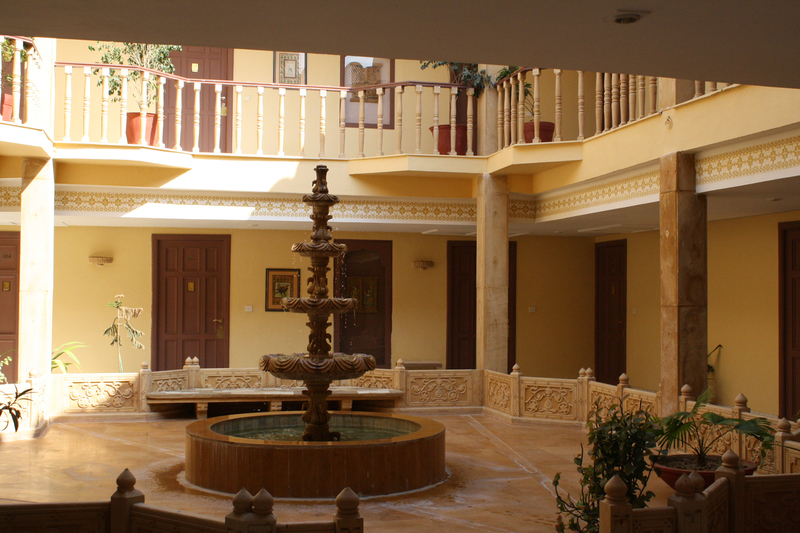 Another room courtyard has a fountain. 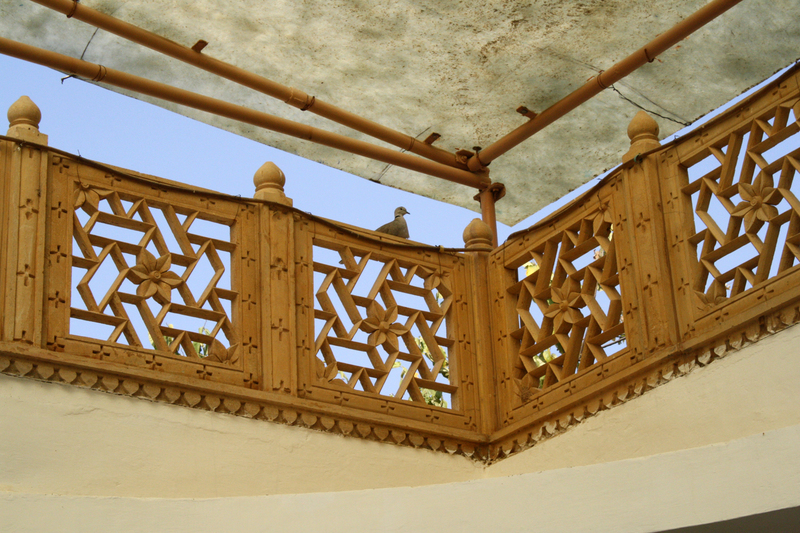 A dove rests on the courtyard canopy fence. 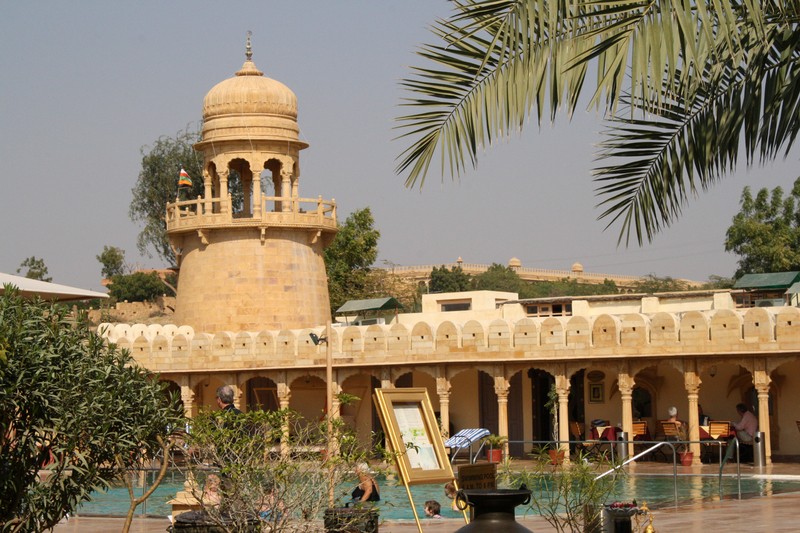 The hotel swimming pool area. 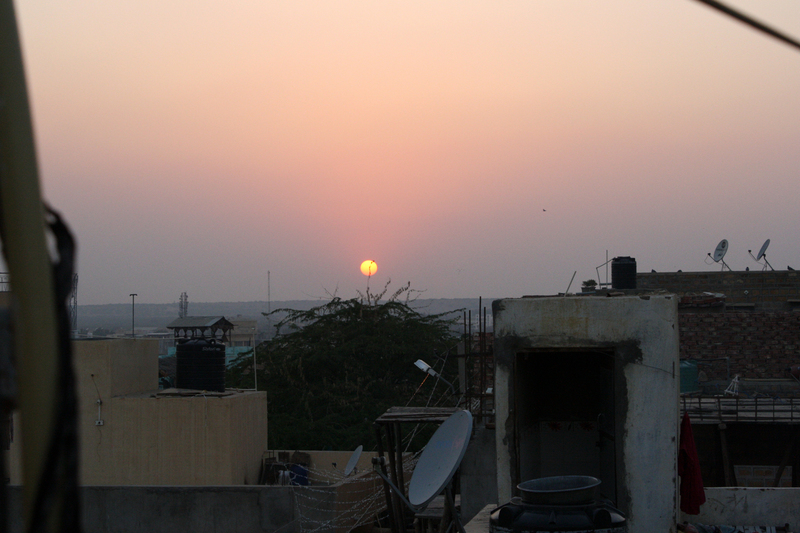 View from the hotel roof. 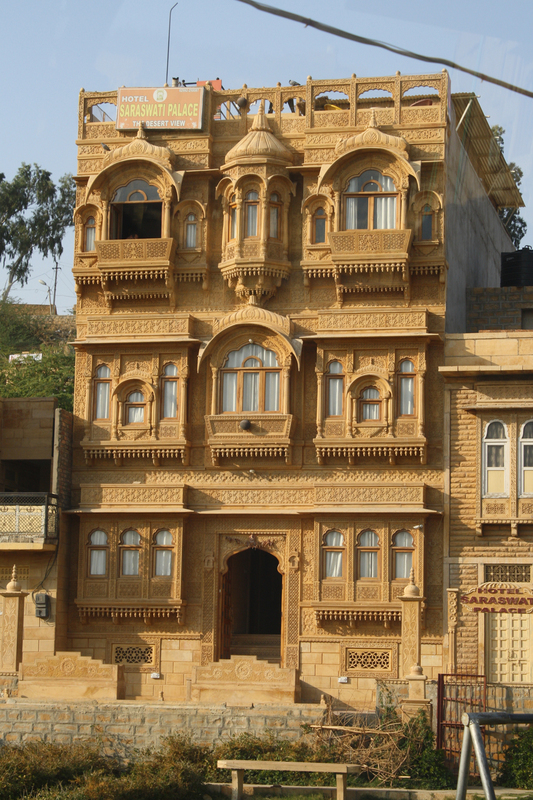 Architecture of the Kalakar artist neighborhood. 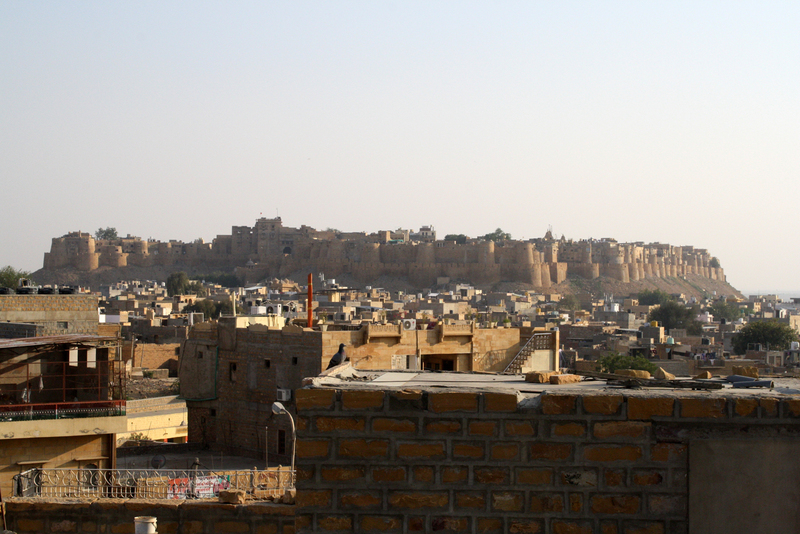 From a rooftop the massive Jaisalmer fortress. Hosting the next music event is Chugge Khan, who was part of the band on the Junun CD. 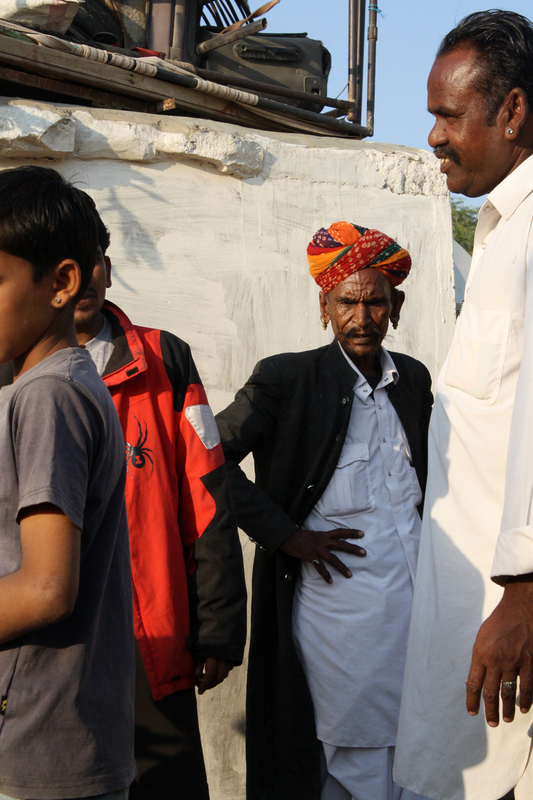 The interesting elder with the turban (multicolored indicating a musician/artist) is the family patriarch. The next generation of singers, who we will see again on another day. 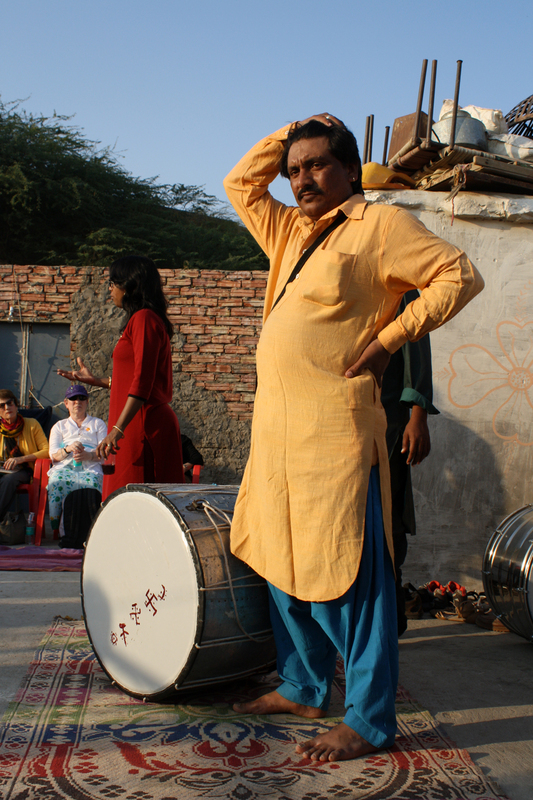 Chugge Khan and a dhol drum. 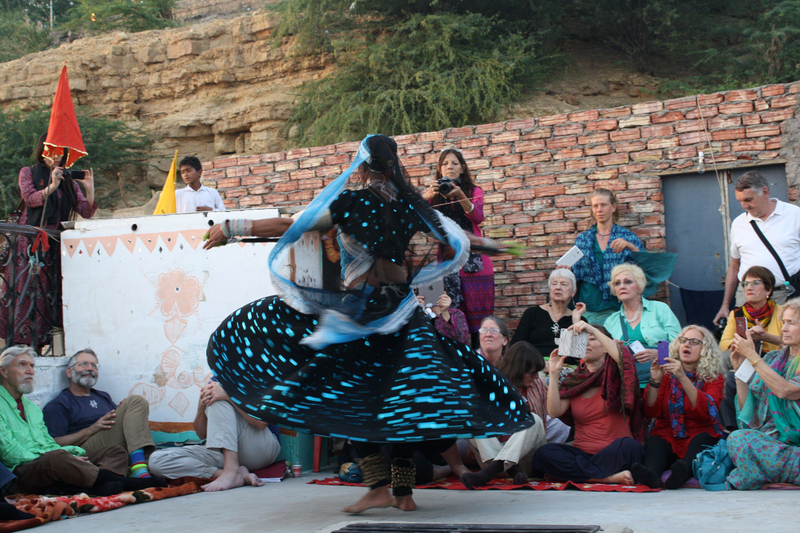 This dancer, and two others to be seen, are transgender or intersex and are described in India as "third gender" or hijra. 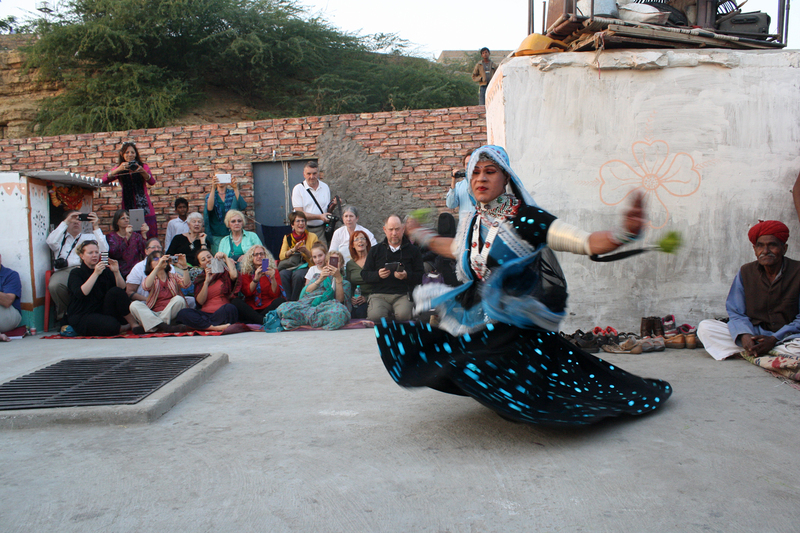 "Men" or "boys" dancing in women's attire is traditional, and they have their own subculture, language, and training. 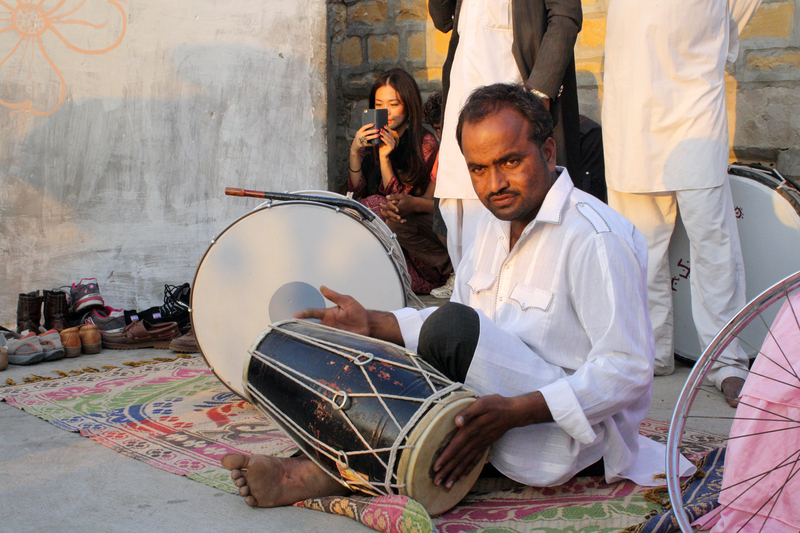 Drummer with dholak. 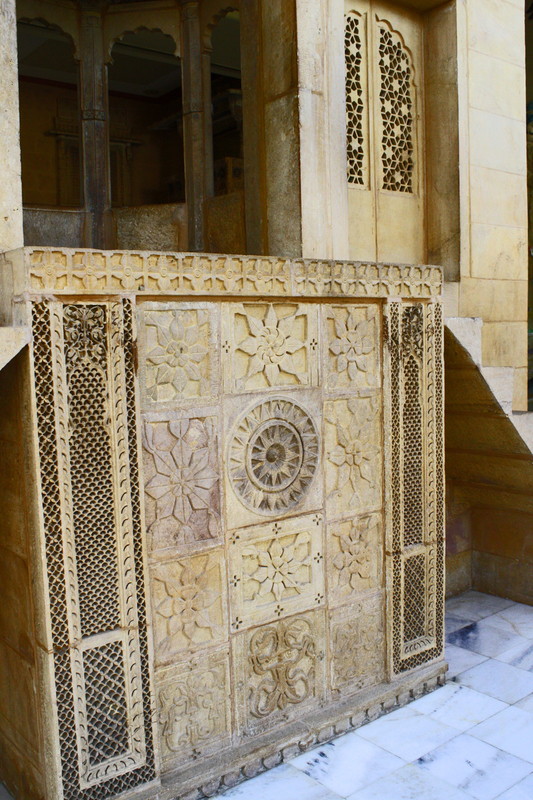 The tabla arose when the dholak was cut into two. 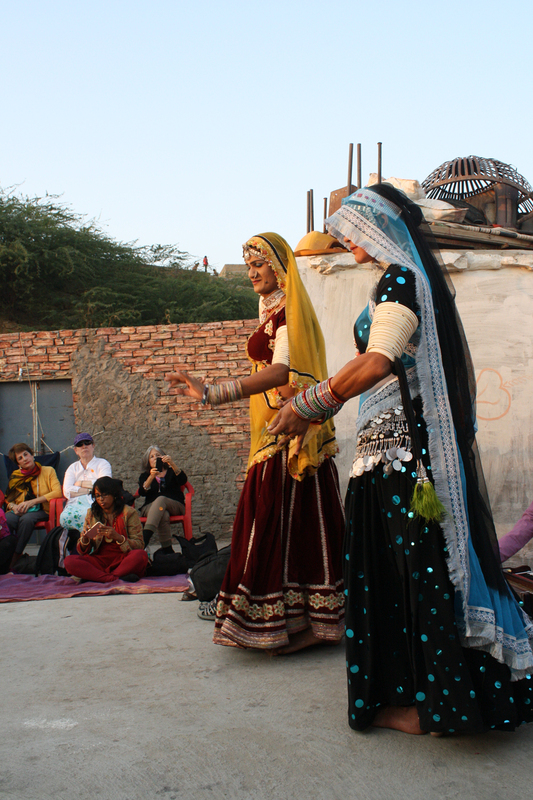 Two dancers. The dance continues. Note the ankle bells. In preparation for knee dancing. Down on the knees and spinning. 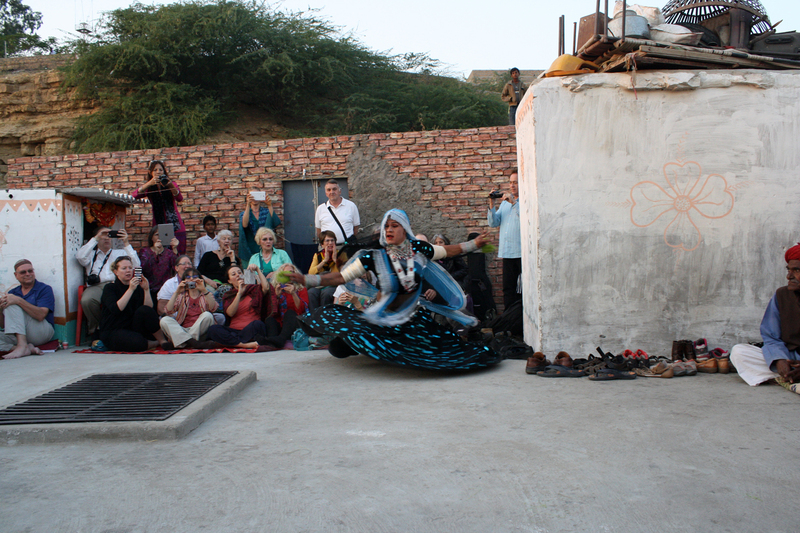 Completing the spin. The concert ends at sunset.